Phonetics is connected with linguistic and non-linguistic sciences. The connection of phonetics with grammar, lexicology and stylistics is exercised through orthography [ ] or (via[ ]) which in its term is very closely connected with phonetics. Phonetics formulates the rules of pronunciation for separate sounds and sound combinations. The rules of reading are based on the relation of sounds to orthography and present certain difficulties in learning, the English language especially or the initial stage of studying. Thus, vowel sounds, for instance, are pronounced not only as we name the letters corresponding to them. The letter: -a- as [ei], -e- as [i:], -i- as [ai], -y- as [ai], -u-u as [ju:], -o- as [ou]. But we can pronounce the letter –a- as [a:] e.g. car, [æ] e.g. cat, as [eə] e.g. care. The letter –e- as [i:] e.g. Pete, as [e] e.g. pen, etc. Through the system of rules of reading phonetics is connected with grammar and helps to pronounce correctly: singular and plural forms of nouns, the past tense forms and past participles of English regular verbs. E.g. [d] is pronounced after voiced consonants, e.g. to bag –bagged. [t] is pronounced after voiceless consonants: to wish- wished. [id] is pronounced after [t] and [d] : to want –wanted, to decide – decided. Some adjectives have a form with – ed- (irregular adjectives): e.g. It is only if we know that [s] is pronounced after voiceless consonants, e.g. books, [z] after voiced e.g. bags, and [iz] sibilants e.g. boxes, dresses. One of the most important phonetic phenomena is sound interchange. It is another manifestation of the connection of phonetics with grammar , e.g. this connection may be observed in the category of number. Thus the interchange of [f] – [v], e.g. wife – wives; [s]-[z] house-houses, helps to differentiate singular and plural forms of such nouns as calf-calves, leaf-leaves, house – houses, etc. Vowel interchange helps to distinguish the singular and the plural of such words as bases [is] but basis [iz], crisis –crises, analysis –analyses and also: man-men, foot-feet, goose-geese, mouse-mice. Vowel interchange is connected with tense forms of irregular verbs, e.g. sing-sang-sung; write-wrote-written. (2) Phonetics is also connected with grammar through its intonation component, sometimes intonation alone can serve to single out the logical predicate of the sentence, e.g. In a formative sentence the rising nuclear tone may serve to show that it is a question, e.g. Posation may also perform a differentiatory function; phonetics is also connected with lexicology. a) Due to the presence of stress or accents in the right place we can distinguish certain nouns from verbs (formed by convertion), e.g. abstract – to abstract, object- to object. b) Homographs (words that are similar in orthography but different in meaning), e.g. lead [i:]-lead [led], row [ou]-row[au] (скандал), etc. c) Due to the position of words accent we can distinguish between homonymous words word groups, e.g. redbook- Красная книга (the book where there are description of rare animals) – red book – colour, etc. a) through intonation and its components, e.g. speech melody utterance stress, rhythm, position, and voice tember, which serve to express emotions to distinguish between different attitude on the pan of the author and speaker very often the writer helps the reader to interpritate his ideas through special words and remarks: a pause, a short pause, angrily, gently. b) Onomatopoeia is a combination of sounds which imitate sound produced in nature. It helps to show the connection phonetics and stylistics, e.g. tinckle, gingle, clinck, clatter, chater. 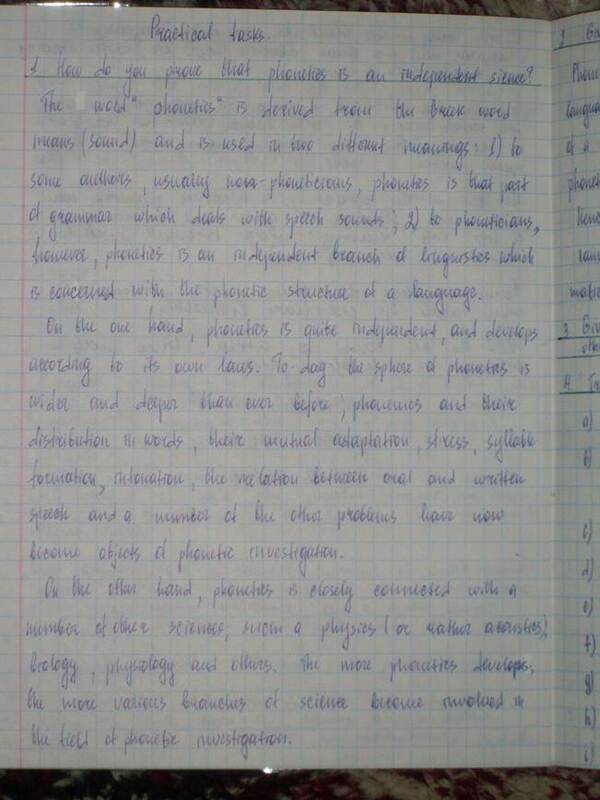 The study of phonetics phenomena from the stylistics point of view is phonostylistic. It is connected with linguistic and non-linguistic disciplines: paralinguistic, psychology, dialectology, etc. Alliteration is a repetition of identical or similar sounds that helps together with due words to important a melodic effect of the utterance.